The summer is upon us and the sun will soon warm us to the point of wishing for winter’s return! What is the best thing about summer? The various get-togethers and events that accompany warm weather of course. There is not a better time to get the long-lost family together for a reunion. And lucky you, A Catered Affair is right here in Vancouver! In today’s society some of us tend to neglect time with family. In the fast-paced world of today it is more and more difficult to set aside a specific time to get the entire family together. Right now is the time to get out the address book and call all the long-lost cousins, uncles, aunts and parents. Bite the bullet and just do it. Invite all of those family members to a nice park for an afternoon and enjoy the special time catching up. First of all, give everyone enough time to get travel plans together if your family is spread out. Giving a few months to a year advance notice is the best way to guarantee success. Keep your family excited with email updates keeping everyone up to date on the planning process. The next step is to figure out a good venue to hold your reunion. Parks are generally a good idea because it introduces an element of the outdoors and usually has entertainment for the children. 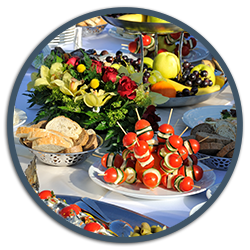 The most important step it to call A Catered Affair and choose one of our exquisite menus. You only need to get everyone there and we take care of the rest. Contact us today at either our Vancouver or Richmond location and make your next reunion one to remember.